The MC Control's touchscreen displaying the default Track mode screen, which shows you the channels or tracks in your project. Euphonix's MC Control is a companion controller to the MC Mix, reviewed by Paul White back in the April issue of SOS. While the MC Mix focuses on fader and plug‑in control, the MC Control gives you hands‑on access to many other aspects of your software via a touchscreen, assignable buttons, and a jog wheel/transport section. 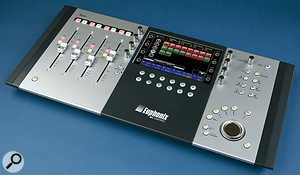 The MC Control can be used stand‑alone (it has four fader strips of its own) or in conjunction with up to four MC Mixes. It's also worth pointing out that at this point in time both the MC Control and the MC Mix are only compatible with Macs, and there's no concrete information as to when PC support will arrive. Although we took delivery of a pre‑production MC Control soon after the MC Mix, a number of early hardware and firmware issues meant that we had to hold fire until solutions appeared. Several months on, a few niggles persist, but this next‑generation controller has had a chance to give a fair account of itself. Physically, the MC Control is a bit wider than the Mix but is still surprisingly compact. Obviously, the build quality is not comparable to more expensive surfaces bearing the Euphonix badge, but it's better than the direct competition, and miles ahead in terms of style. Connection to the computer is via a supplied Ethernet cable, which is simple enough if you have a single unit, but if you're also using MC Mixes or other network connections, you'll need an Ethernet switch or hub. Like the Mix, the MC Control's communication with your DAW is mediated by a client application called Eucontrol. This program allows you to change settings and fader layouts, and translates Euphonix's proprietary Eucon protocol for your software applications. 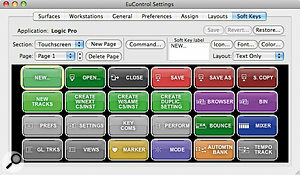 A Eucontrol icon is added to your menu bar, which gives access to the settings panel and indicates when controllers are connected and ready to use. On occasion, my Mac would freeze while scanning for controllers, requiring a hard restart. This happened less as new updates arrived, but never completely went away. 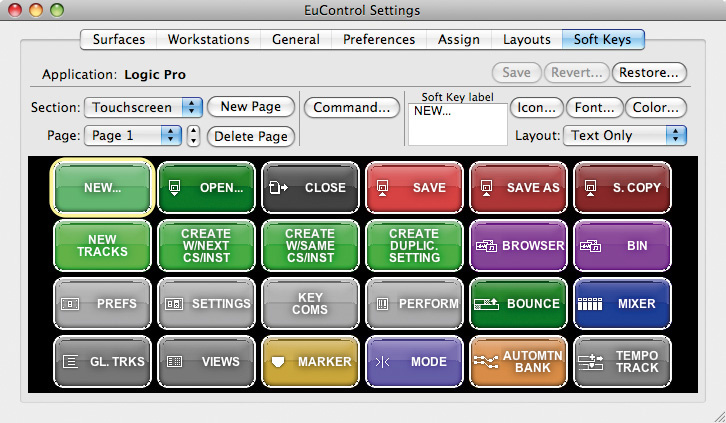 Once you've got the hardware hooked up and Eucontrol installed, you need to make settings for your software of choice. For Logic Pro, no further setting up is needed, as Logic supports the Eucon protocol directly. Nuendo and Cubase also support Eucon, but you need to download an activation code and declare the controller manually. By the time you read this, Digital Performer should also support the high level of controller integration offered by Eucon. If your DAW does not support Eucon, all is not necessarily lost, as the MC Control offers HUI and Mackie Control emulation modes. I tested Ableton Live and Propellerhead Reason in Mackie Control mode, and Pro Tools in HUI mode, with varying degrees of success. All of these protocols allow control over faders, pans, sends, plug‑in parameters, transport, I/O routing, insert selection, and several miscellaneous commands common to many DAWs. Beyond this, the MC Control can also send keyboard commands, allowing many other operations to be performed from the surface. Here I've used the Soft Keys editor to map out some of my most commonly used commands in Pro Tools — something I could previously only have done with a Digidesign Icon control surface. The left‑hand side of the MC Control is devoted to four channel strips — identical to the ones on the MC Mix but without the knobs. Strangely, the faders have been moved up the panel to fill the gap left by the knobs. This means that the faders on the MC Control are out of alignment with those on the Mix units by over an inch, which can be misleading when visually scanning your fader settings. Each strip has buttons for Solo and On (the inverse of Mute) at the top, with Record Arm and Select buttons to the side. Secondary functions are accessed by holding either of the two Shift buttons: Shift and Rec cycles the channel through automation modes, while Shift and Sel opens the Assign options, where you can lock faders to specific DAW channels. The centre section has a touchscreen supported by four touch‑sensitive knobs on each side. These knobs perform the same duties as their cousins on the MC Mix: controlling eight channels of pan or send level, assigning routing and inserts, or adjusting plug‑in parameters. Below the screen are 12 'Soft Keys', which can be assigned to various functions across multiple pages. The right‑hand section has the same channel navigation controls and application switching buttons as the Mix, below which is a transport section, fanned out around a jog/shuttle wheel. The first unit we received had a rather unpleasant, scratchy jog wheel, but Euphonix were in the process of updating this, and the second unit we tried was greatly improved. As well as traditional transport jog and shuttle, the wheel can be used for zooming and for region trimming. The rear panel is fairly sparse, featuring sockets for power and optional footswitch and an RJ45 port for connection to your computer or network. This photo also gives you a good idea of just how slim the MC Control is. Clearly, the most striking and innovative feature of this controller is the touchscreen. The screen is about 6x3.5 inches, with an impressive resolution of 800x480 pixels. Columns at the left and right of the screen are reserved for displaying the functions and values of the adjacent knobs. The bottom quarter displays the functions of the assignable buttons and the rest of the screen can be switched between three modes: Tracks, Soft Keys, and Setup (see the 'Monitor Control' box for more about the last). The default Tracks mode displays an 8x4 grid of squares representing the tracks or mixer channels in your project. In Eucon apps, these are colour‑coded as they are in the software. The default mode allows you to select a track by touching it, and also banks the faders so that the selected track appears on fader one. Mode buttons to the left of the grid allow you to control mutes, solos and record-ready status by touching tracks on the screen. The screen does not support multi‑touch, so you can't make multiple mute, solo, or record‑arm assignments at once. A greater issue is that the touchscreen is a bit slow and unresponsive at times. Changing modes and pages is slow, and sometimes you need to press and hold for a short time before your input is received. Quite often your first press doesn't register, and you have to take your finger off and try again. At other times it's quite snappy. Hopefully the screen response will continue to improve with new software updates. A bigger problem is that the MC Control's screen has some hardware issues that let it down. Firstly, it has a rather limited viewing angle: you really need to be looking more‑or‑less straight down at it. In a typical position on a desktop, the situation teeters on the edge of acceptability. The screen also has a noticeable flicker, which becomes dramatic when turning up the brightness to try to help the viewing angle issue! Apparently (according to a suggestion by Euphonix, and backed up by web forums), this problem may be confined to regions with 50Hz power supplies. On occasions, this flicker extends to some of the Solo and On buttons on the fader strips. As DAW controllers go, the MC Control is more elegant than most. Unfortunately, this picture also shows the best viewing angle for the screen — get too far away from the direct birds‑eye perspective and it becomes less clear than you might like. The MC Control's killer feature is its 'Soft Keys'. This term is used both for the 12 physical buttons (also called 'surface keys') and the command icons that appear in the Soft Keys page of the touchscreen. Ready‑made control sets are pre‑installed for a number of applications: Logic, obviously, but also non‑Eucon apps like Pro Tools. Both the screen and the buttons can be independently cycled through different pages of commands. Logic has seven pages of screen commands, while Pro Tools has over 20! In Logic, the first page of buttons is dedicated to changing tool modes, while page one on the screen is mostly for window management. Other pages group together playback and navigation controls, automation controls and memory location recall buttons. Where the interface really starts to impress is when it strings together commands into a workflow. For example, if you press the Mixer icon in the first page of touch commands, the Mixer view is opened in the software, and the touchscreen also switches to a different page of mixer‑related operations, such as hiding/showing track types, creating auxes, and so on. Similar ideas appear in the Pro Tools control set. For example, if you choose New Track, the touchscreen switches to a set of buttons for setting options in the New Track dialogue in Pro Tools. What makes this possible is that any Soft Key can trigger a series of commands that can include keyboard strokes and menu calls, as well as dedicated Eucon/HUI commands. Eucon is really well suited to Logic, which has a huge library of shortcuts, many of which languish unassigned in dusty corners of the Key Command window. For example, the highly useful (but under‑utilised) Zoom Navigation system shines when assigned to Soft Keys. A single button can zoom an edit selection to fill the screen, and store the view as a navigation marker. Group this button with forward and backward zoom navigation buttons, and you can return to this stored view with a single touch. The frustration with most control surfaces is that their predetermined set of controls can never be a perfect fit for everyone's working practices. The MC Control's most exciting feature is the option to program your own control pages via the Eucontrol software's Soft Key editor. This allows you to set the name, colour, icon and, of course, the function of any button or screen pad. Not only can you set the font and the text/background colours, you can even load custom graphics from your own file or the MC Control library. 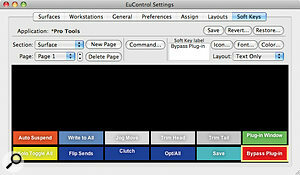 The commands editor offers a huge list of operations divided into four categories: Key Commands, Page Select, Layout or Eucon. Key commands can be any string of key strokes, including modifiers like Ctrl or Shift. In most cases these will be something simple like Command + S (Save), but you can be creative here. For example, Mac OS lets you browse menu commands by pressing Ctrl‑F2, then typing the name of the menu, hitting enter, then typing the name of a command or submenu. Other command types are Page Select, for changing Soft Key pages, and Layout, which lets you recall custom fader assignments. However, the really powerful commands are found in the Eucon category, which also contains subsets for all HUI/Mackie Control messages. The Eucon commands vary by application, with many being specific to a particular host. I set myself the mission to see how far I could get even without Eucon, by putting all the operations I use while mixing in Pro Tools within easy reach. Due to the slow screen response, I concentrated on the buttons. With a combination of HUI commands, key strokes and some hackery that Euphonix seem to have been able to sneak in for the jog wheel, I got some of my favourite controls that I'd normally only be able to access from a Digidesign Icon surface. I managed some neat tricks, such as having the Send Flip button also bring up a Touch Screen page with buttons to flick between the different send slots. The Soft Keys editor displaying preset commands for Logic. On the MC Mix, plug‑in parameters are controlled from the eight channel strip rotaries. On the MC Control, these appear on the eight knobs around the touch screen. The knobs also double as buttons for switched parameters. On the Mix, the function of the buttons (plug‑in control, pan, sends, etc) is switched via five dedicated buttons. On the Control, the function is chosen by clicking the appropriate knob when the screen is at the top level of a hierarchical menu. The Mix has the same menu system, but the dedicated mode buttons mean you mostly don't need to think about it. I found navigating through the knob functions more straightforward on the Mix, which is unexpected given the lack of a screen. A surprising omission on the MC Control is the ability to organise plug‑in parameters into your own page sets. Instead, plug‑in parameters are either mapped in the order they appear in the flat list of automatable controls in the host, or in preset maps programmed by Euphonix. Predetermined sets tend to be provided for a DAW's built‑in EQs and compressors. In both Logic and Pro Tools, there are two different layouts (a comprehensive set and a 'quick access' set), depending on whether you open the EQ/Dynamics controls directly or go to the plug‑in via the Inserts mode. With the plug‑ins laid out in sensible page sets like this, the knobs work well. 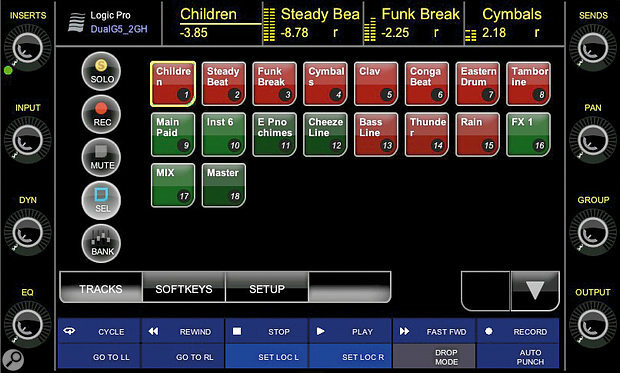 However, for the centre section to be genuinely usable with other plug‑ins, you really need to be able to make your own maps, as you can, for example, with Novation's Automap 2.0 products, or with Digidesign control surfaces and Pro Tools 8. I also tried the MC Control with Ableton Live and Propellerheads Reason, both using the Mackie Control emulation. Control of Reason was at best limited, and I wouldn't recommend the MC if Reason is your primary music application. Live was better, with track/fader control working as expected, although you have the same problem as Pro Tools in that banking is in steps of eight, when you've only got four faders. Transport control works, and the jog wheel is set up to scroll through the Session view's Scene list. To get more than this, you'll need to get to work programming some Soft Keys yourself. I wasn't able to try the MC Control with Cubase or Nuendo, but I've no reason to expect that the integration is any less excellent than with Logic. My few months with the MC Control have been a rocky affair. I can't think of another product that I've tried to like so much, and at times it really impressed. Examples of this are the Monitor Control, the Soft Key editor, with its support for strings of key strokes and multi‑stage commands, and the jog wheel support in Pro Tools. As a mix surface, it's less immediate than the MC Mix, whose dedicated channel-mode buttons feel much more straightforward, somehow. The fact that there are only four faders is not a problem in most circumstances, but it means banking doesn't work properly in HUI or Mackie Control modes. The Soft Key system does things previously only possible with surfaces costing five figures, and this is what would tempt me to add the MC Control to my existing MC Mix. The customisation options are inspiring, especially for those who get frustrated by fixed control surfaces. On the other hand, you can't ignore the disappointing touchscreen, with its flicker, narrow viewing angle and occasionally sluggish response. The real challenge for the screen is that just about everyone has now tried an iPhone or iPod Touch, which respond instantly to the lightest touch. However, I found that the surface becomes much more usable if you group your main controls on the physical buttons, and reserve the touchscreen for subsidiary selections and view changes. In fact, if the centre section was available at a lower price without the faders, I'd probably go for it, even though my primary DAW is not Eucon compliant. Pro Tools is the only non‑Eucon based DAW that I'd recommend the MC Control for, though: the Live and Reason support don't justify the price. In summary then, the MC Control is a few firmware and component upgrades away from being an incredible, next-generation control surface. With a better touchscreen and user plug‑in mapping, the MC Control would be a stunning success. Even so, there nothing else out there in this price range that can do the same things, and if you have a Eucon-compatible DAW, the user‑programmable soft‑keys may be exactly what you need. Try before you buy. In this price range, the obvious competitor to the Euphonix MC range is Mackie's Control system. Although this doesn't have the touchscreen or the Soft Keys flexibility of the MC Control, it does offer a similarly modular approach, allowing you to expand the main unit with additional modules. The key difference is that you can use the MC Mix and the MC Control independently of one another, whereas the Mackie system must always be based around the central Mackie Control unit. If you're interested in the touchscreen and customisation aspects of the MC Control, Jazz Mutant's Lemur or Dexter controllers may be worth considering, However, while these devices both offer multi‑touch touchscreens, they lack any other physical controls and they are significantly more expensive than the Euphonix. Beyond this we're into very high‑end territory (where the prices rise dramatically) or looking at far cheaper products that really can't compete with the functionality of the Euphonix — proving, perhaps, that in many ways the MC Control offers something quite unique. Despite Digidesign's decision not to support Eucon, a lot of these units are likely to get used with Pro Tools. Digidesign's only offering anywhere close to this price point is the Command 8, which struggles to keep up in terms of flexibility and looks. Personally, I bought an MC Mix for use with Pro Tools, but would I add the MC Control? Well, Euphonix have done a good job with the limited control set of HUI. For example, moving or trimming regions with the jog wheel is implemented far more successfully than on any current Digi surface. Also, Pro Tools has key commands for almost every operation, which the Soft Keys can take great advantage of. The factory Soft Keys set has too many pages (given the slow paging), and is only half finished (a number of Keys have been created but no commands added), but at the very least it shows what you can do if you sit down to make your own control set. Although the Soft Keys and jog/edit wheel work great with Pro Tools, there are some distinct drawbacks that probably mean I'd sooner add a second Mix than a Control. Firstly, the HUI protocol only supports controllers with multiples of eight controllers. This means that when you bank the MC Control along the mixer, it misses out every other four faders. Secondly, fader locking doesn't work, which is a real shame, as this is a feature only available on D‑Command/D‑Control among Digi's range. Lastly, the controller would occasionally just cease to be recognised. One of the most useful features of the MC Control is its monitoring control facility, which works in conjunction with the included Studio Monitor Express software. 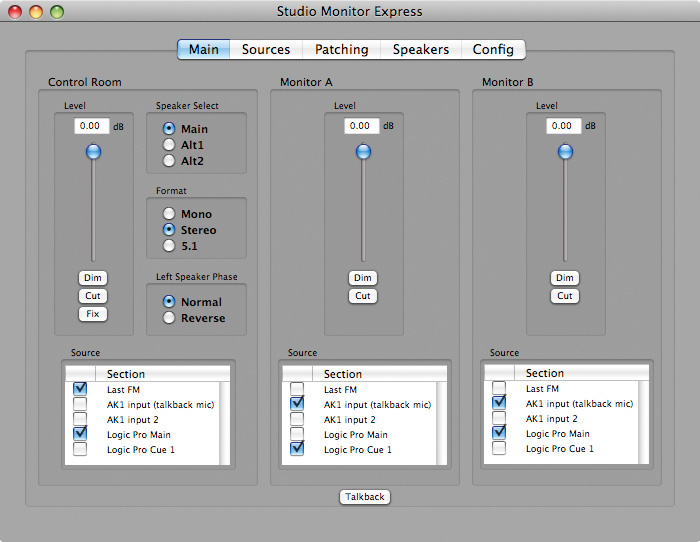 Rather than taking the standard (and limited) route of adding a physical analogue monitoring section, Euphonix include the rather brilliant Studio Monitor Express software, which works as a monitoring matrix within your Mac. You can use SME to set up discrete sources, both from individual applications and physical inputs on your interface(s). Separate source selections can be assigned to your control-room monitors and two cue mixes. Outputs are very flexible, allowing you to set up three different monitor sets and even patch the channels to the correct speakers, which is really useful for surround setups. It probably comes as no surprise that this feature is unavailable when you're using Pro Tools, which only runs with proprietary hardware, rather than Core Audio. However, you could run your outputs through an additional non‑Digi audio interface for monitoring purposes, which would probably still be cheaper than buying a second, dedicated monitoring unit. A powerful feature of the MC series is that the surfaces follow whichever application is brought to the fore. When you switch application (either from the computer or with the dedicated button on the controller) the MCs instantly update their faders and Soft Key set to control the focused app. As if this wasn't clever enough, you can also use your MC surface to control other computers on a network. It's not uncommon for studios to have more than one machine — for example, a dedicated Pro Tools system kept separate from a synth or MIDI workstation. By installing the Eucon Workstation client software on both machines, you can switch control from one to the other. What's more, you can choose to have your keyboard and mouse input automatically re‑directed as well. Brilliant. Unfortunately, I had little success getting this working. I connected a G5 running Pro Tools HD and an iMac running Logic to the same Ethernet switch, along with an MC Control and MC Mix. Although both Macs could see the surfaces and I could manually remove and attach units from one computer to the other in Eucontrol, I couldn't get the fast switching to work, as the two machines didn't acknowledge each other as 'Workstations'. Eucon, HUI, Mackie and keyboard shortcuts can be combined into macros. Studio Monitor Express offers a powerful monitoring matrix, using your existing interfaces. Touchscreen can be slow and often doesn't recognise touches. Pro Tools support limited to HUI. Screen and button lights flicker. No user-editable plug‑in control mapping. Poor viewing angle (you need to look straight down). The MC Control is a bold and innovative step forward for control surface design, with powerful customisation options, slightly let down by screen quality. Euphonix +1 650 855 0400.